Hopefully the second bout of the evening would bring better fortune for our Welsh fighters. A regular visitor to Wales, Jamie Quinn entered the ring first to contest a 4×3 bout against Cardiffs impressive Jacob Robinson. Looking in tremendous condition Robinson was led to the ring by master trainer Tony Borg and his ex World champion father Steve, who himself looked like he could still make his old fighting weight. As boxing fans know fighters like Quinn make a living from their toughness and durabilty and are often capable of springing an upset against prospects that take them likely. This made Robinsons assured start, working behind his southpaw jab and not taking any unnecessary risks all the more impressive. Robinson was patient and worked Quinn over with punches to head and body. 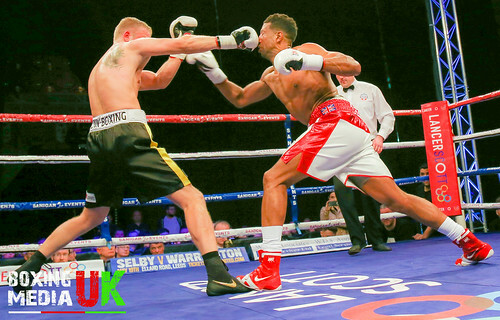 The early rounds were banked by the Cardiff fighter as he looked like a boxer who has had considerably more bouts then he has to date. Quinn, operating behind his tight guard seemed in little trouble, although good body shots from Robinson drew a response from the Stockport journeyman. Any chances Quinn saw to go on the offence were offset by Robinsons impressive footwork as the final two rounds followed a similar pattern. 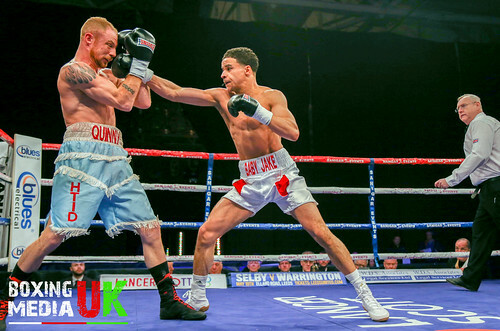 Referee Mr Martin Williams was kind to Quinn who was given a share of a round on his 40-37 card ,in favour of the home fighter.Jacob Robinson is proving to be a very exciting prospect indeed. Robinson weighed 9st4lb for this fight ,with Quinn coming in at 9st7lb. Its always a privilege to witness the skills of olympic silver medalist Fred Evans. The Tony Borg trained fighter met noted tough man and a regular Visitor to Wales ,a man incredibly taking part in his 167th paid contest William Warburton. 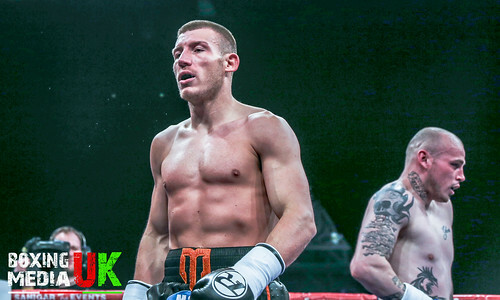 Theres very few Middleweights around that have the skillset of Evans as the Cardiff man started a lot more aggressively then he normally does. Two meaty looking left hands crashed into Warburton who looked in a considerable bit of trouble. This was rare for a man that has only been stopped three times in five years. Evans would not let his opponent settle at all as he doubled up with his lead causing Warburton to head back to his corner at the bell a very relieved man. Evans controlled the range effortlessly and totally negated any attempts at counters from his opponent. Hurtful rights to the body ensured Evans claimed both of the rounds heading into the third. Evans eased off a little, although the contest was clearly one way traffic still. Warburton seemed to warm to the task but was clearly second best as Evans’s body shots found their target behind the elbows. In nearly 200 contests, William Warburton has unlikely met too many fighters that possess the natural ability of Fred Evans as the Welshman collected a comfortable 40-36 points win from Referee Mr Chris Jones. Surely Evans’s team are targeting championship gold in the near future. Kristian Touze was looking to keep his undefeated record intact as he faced the tricky and unorthodox Alec Bazza from Belfast. Touze has nice boxing skills and is most comfortable operating on the back foot, therefore it must has come as a shock to the Swansea stylist when he was immediately charged by Bazza and caught off balance with one of the Belfast mans wild lunges. Touze was more shocked then hurt has he beat the count but got into the mistake of trading when he didn’t have to. After a talking to from his corner Touze gathered himself and began to get back to his boxing, picking off Bazza as he came charging in. Touze was doing a much better job of not getting involved whilst avoiding his opponents aggression. For me the Swansea southpaw landed the cleaner, more effective shots in rounds two and three. Bazza was most definitely not deterred though and was showing how records can be deceiving in the sport. Touze was using pivots to force Bazza into missing clearly at times, although the odd dangerous looping shot managed to land on the Welshman. The fight went to the scorecards.It did seem to me that Touze had managed to win the last three rounds after a bad opener, although Mr Jones 38-38 credited both men for a very good contest. Touze remains unbeaten at 5-0-2. Bazza goes to a deceptive 0-34-3. Touze 9st9lb Bazza 9st12lb. 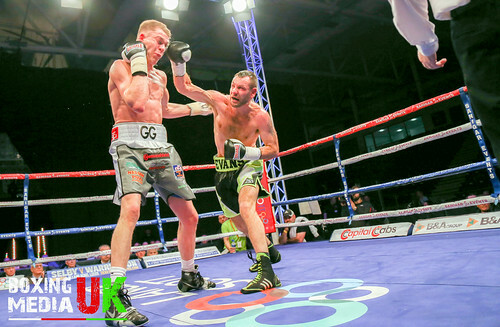 The Welsh Lightweight Champion Gavin Gwynne was originally set to contest the vacant Celtic title on the show. Unfortunately this bout fell through, so the ever improving Gwynne stayed busy by contesting a 6x3s with Hereford journeyman Dean Evans. There was no feeling out round for Gwynne as the Merthyr man opened up straightaway on Evans. The Hereford fighter was brought out of his comfort zone as Gwynne mixed up his work excellently. Lead left hooks, right hands and hard body shots all quickly found their target. A hurtful looking hook drew a response from Evans who didnt look comfortable at all with Gwynnes frantic pace. Evans has the habit of leaning forward with his head so Gwynne wisely switched to the body, eventually setting up a chopping right hand that sent Evans to the canvas. Gwynne sensed the end could be near as his opponent looked on very unsteady legs. Evans had to call on all of his experience to make it into the third round. Evans perhaps realising he had little chance of winning the contest went into survival mode. Gwynne carried on with his relentless work rate and didn’t even look close to becoming fatigued. Gwynnes fitness and conditioning has gone through the roof since hooking up with Tony Borg and the only danger seemed to be from the use of the head and elbows by a desperate Evans. Gwynne must have been frustrated in there and had to be wary of being cut from a clash of heads. 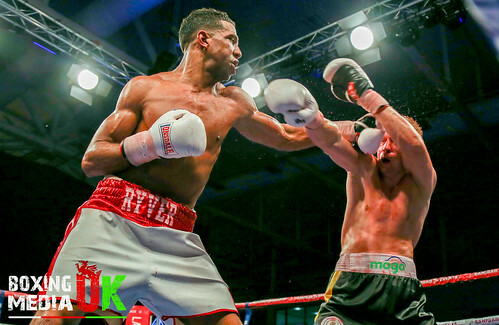 Rounds five and six were clearly banked by the Welshman . He must have been disappointed not to be fighting for the Celtic title, but stuck to the task at hand and put in a professional performance. 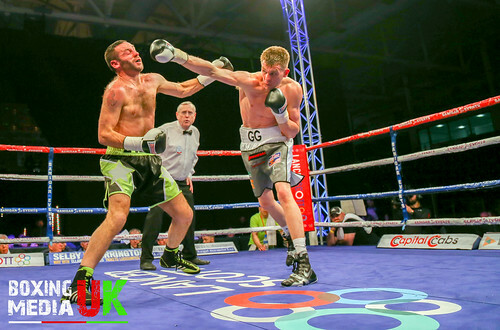 Referee Martin Williams’s 60-53 card in favour of Gwynne was a formality with the Welsh Lightweight champion now boasting an undefeated record of 9 wins from 9 contests. Both men weighed 9st 12lb. Pontypool’s Keiran Gething was also looking forward to a title shot when the Fire and Ice show was originally announced. Gething was set for a Welsh Derby with Tony Dixon who very unfortunately had to pull out with an eye injury. 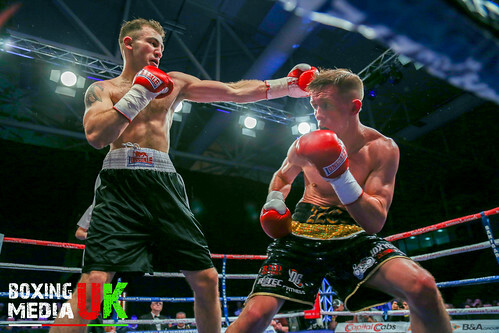 Up stepped one of the best Welsh fighters of recent years Bradley Pryce who beforehand had promised that this would be his final fight regardless of the outcome. 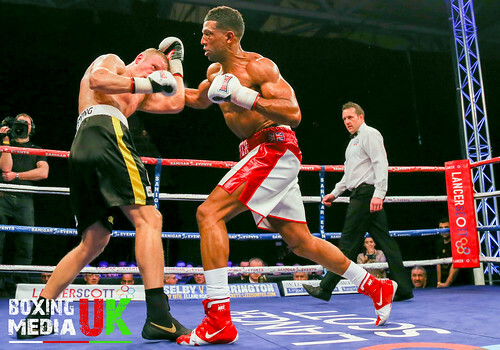 Many people were split in their opinions of who would prevail, would it be the ever improving Gething with his youth and relentless work rate or the experience of Bradley Pryce . 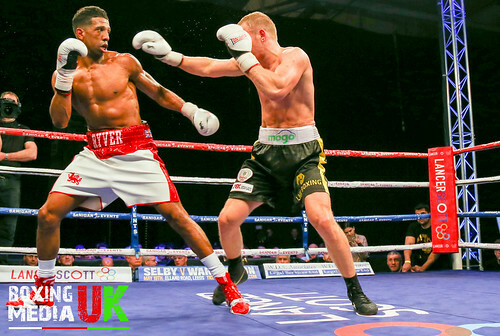 As soon as this 6 round Super Welterweight contest got underway, it became apparent how effective Gething’s jab was. Not only was it finding the range and setting up power shots but hurting Pryce who struggled to stop it. 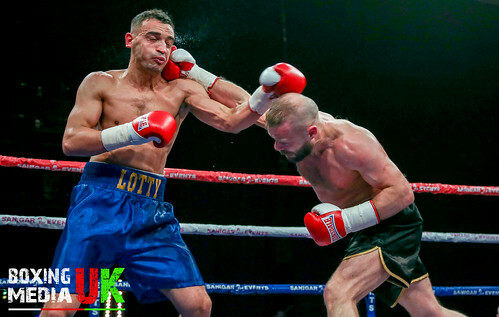 Training with former Commonwealth champion Jamie Arthur has worked wonders as Gething bossed the early rounds with his lovely left jab whilst he cut off the ring and remained patient. Pryce, with ex world champion and long time friend in his corner, Gavin Rees was displaying the heart and determination he had made a career out of, but it was Gething who was clearly dominating. Pryce was pot shooting from the outside but his task was made even more tougher by a heavy nose bleed courtesy of Gething’s hard accurate punches. Pryce’s breathing was affected as his nose continued to pour blood, Gething showed no sign of let up as he combined educated footwork with his sharp offence to keep Pryce off balance. 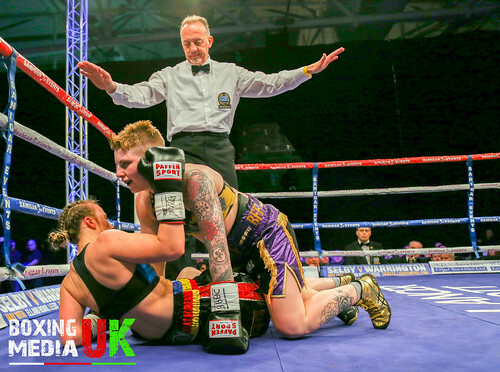 Things got worse in the fourth round for the Newbridge warrior as Gething landed a huge right hand that momentarily staggered Pryce and forced him on the ropes. 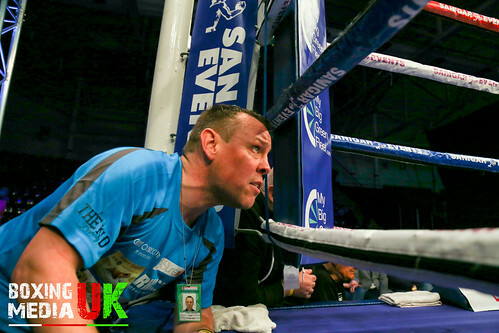 Referee Chris Jones began to take a close look at Pryce as Gething showed his older and more experienced opponent no mercy whatsoever. Pryce did extremely well to last the distance and rightfully received a nice ovation as the 60-54 verdict in favour of Gething was announced. 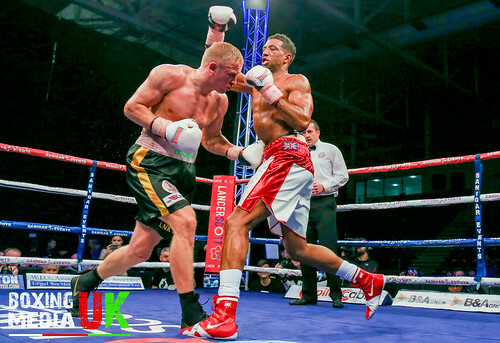 Bradley Pryce took to social media to announce his retirement immediately following the fight. What a servant to Welsh boxing he has been. We wish him all the best. As for Gething, for me this was his standout performance to date, his ring craft and shot selection was top drawer. Boasting a fan friendly style, Keiran Gething could well be looking for titles sooner rather then later. After the late withdrawal of quality veteran Charles Adamu, Cardiffs Nathan Thorley was unfortunately left without an opponent. Noted tough man Adam Jones, a man that comes to fight and who’s never been stopped in 44 fights stepped in to provide Thorley with a very good test. The opening round, of a scheduled 8 began very tentatively with both fighters sizing each other up. Thorley perhaps bagged the opener but was bellowed at by his corner to use his left jab a little more. Jones had no answer to the Thorley jab but remained dangerous at all times. Fighting a replacement is never easy and Thorley can be forgiven for being a little tense and cautious. There seemed to be little doubt the Welshman was winning, although Jones was slowly but surely edging closer. 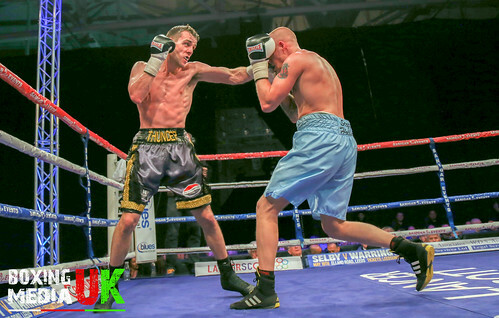 Thorley displayed good defensive skills as Jones began to open up with punches over the top. After an uneventful fourth round ,Thorley upped his game to keep his nose in front. Jones walked forward in an attempt to rough Thorley up and to drag him in a close quarters fight. With the likes of Jones though, the fight ending punch is never quite there. Thorley wisely didn’t load up and picked up the points to enter the 8th and final round seemingly comfortably ahead. Credit to Jones who did not stop coming forward, and his hard looking punches would trouble any fighter that wasn’t defensively sound. Still, despite the disappointment of the highly regarded Adamu withdrawing, Thorley has another 8 good rounds in the bank and deserved the 79-75 verdict from Referee Reece Carter. 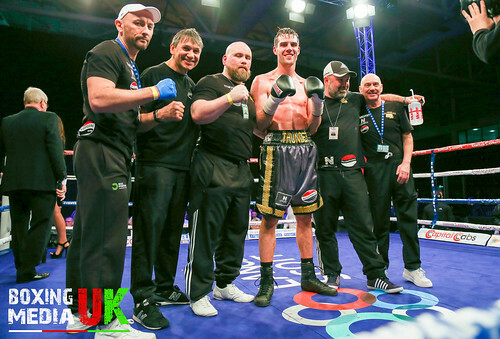 Thorley has shown plenty of improvement in recent fights, thanks to the help of talented trainer Chris Davies. 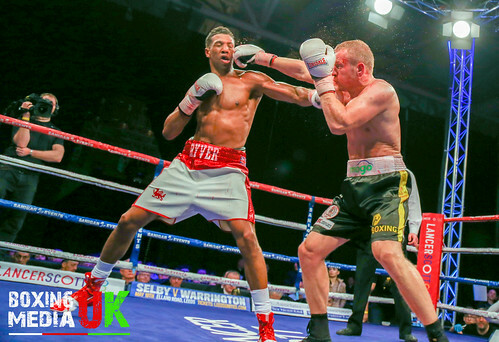 Thorley captured the Welsh light heavyweight title with a big knockout of Jermaine Asare in his last fight and has clearly shown he can punch as well as box. Thorley will tick over in the gym and will hopefully land a big fight as he continues to climb the rankings at Light heavyweight. 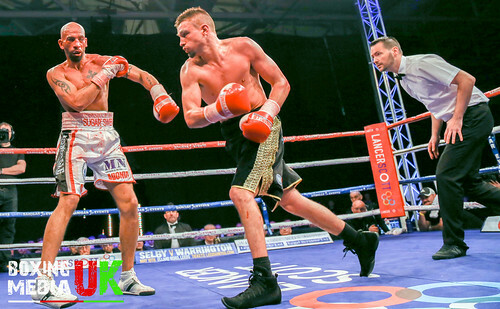 Next up was a real treat for Welsh boxing fans as we had the chance to see World class Middleweight Liam Williams stay busy on a local show. Credit to Daryl Sharp who had the unenviable task of facing Williams at very short notice. Looking in fantastic shape, Williams wasted no time at all as he ominously stalked Sharp from the off. The Lancashire journeyman was on the retreat as Williams landed sickening punches to the body with both hands. The southpaw stance of Sharp posed little trouble to Williams who looked extremely relaxed as more body shots slammed into Sharps midsection, then a right hand to the chin clearly hurt the Englishman. Williams who has such good footwork, effortlessly cut the ring off and during the third round landed a mean right hand which sent Sharp staggering against the ropes. Referee Martin Williams quite rightly stopped the contest to prevent Sharp from further punishment. Williams highly ranked and highly regarded at world level will unlikely face this level of opposition again and it will be interesting to see where the Classy Clydach Vale Middleweight, who clearly has plenty more to give goes from here. The last contest of the night saw the return of one of Cardiff’s favourite sons Craig Kennedy. 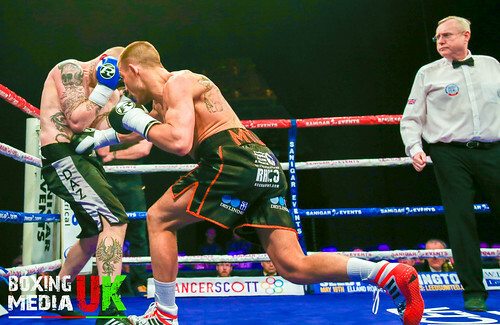 Back on the 26th May Craig Kennedy unfortunately came up short against the highly dangerous Matty Askin in a bid for the British Cruiserweight title. Therefore this scheduled eight rounder against Nikojas Grisunins would prove to be an indicator of what Kennedy has left to offer the sport. 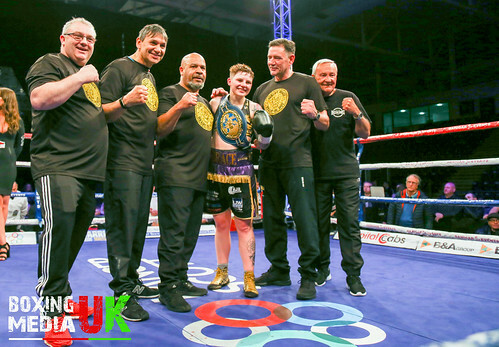 A huge positive for Kennedy was having the mastermind Gary Lockett in his corner, who would have spent long hours getting him back to his very best. 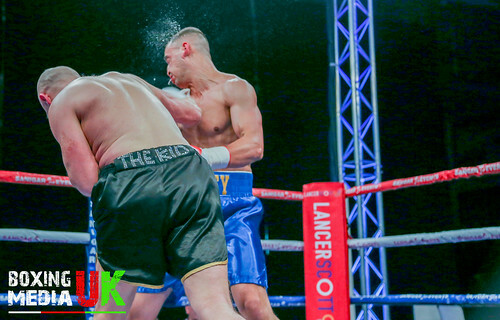 There have been question marks over Kennedys defence and punch resistance, but straightaway he operated behind a nice jab with his hands firmly by his chin. Latvia’s Grisunins certainly looked like no pushover as he began to advance in a European style southpaw stance. Kennedy took the opening round with a very well timed right hand, the go too punch against a southpaw. Kennedy followed the instructions from Lockett very closely and refrained from getting into trading with the Latvian who was looking to get inside. Another sharp right hand from Kennedy drew blood from Grisunins who managed to smirk, a clear indication usually that the punch has hurt . kennedy landed more straight shots in the third round as the blood seemed to be a major distraction for Grisunins. Despite collecting a slight abrasion under his left eye , Kennedy was controlling the fight from the outside as his opponent began to wear a mask of blood. Grisunins was understandably struggling to breathe, and despite passing a doctors inspection in round five was getting picked off by Kennedy who was boxing very smartly indeed. Kennedy’s continual landing of the jab ensured Grisunins trudged back to his corner at the end of the 6th a very disconsolate figure indeed. Grisunins only hope was landing a big left hand but Kennedy was wise to this and kept moving his feet. More facial damage was collected by Grisunins in the 7th and a clash of heads also resulted in a cut appearing over Craig Kennedys right eye. Despite the best efforts of his opponent Kennedy stuck to his game plan and managed to win his comeback fight 80-72 for referee Mr Reece Carter. An assured display of smart boxing from Kennedy who could well be back knocking on the door of British title level now he his under the tutorlage of Gary Lockett. The Cardiff Cruiserweight moved his recoed to 17-1 and weighed 14st3lb. Credit must go to Sanigar events for bringing us such a packed card of professional boxing following a number of frustrating withdrawals. 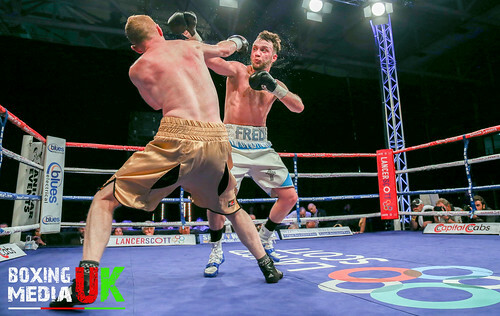 The Show entitled Fire and Ice held at Cardiff Ice Arena, went ahead despite a few setbacks and proved to be a highly entertaining night of boxing. 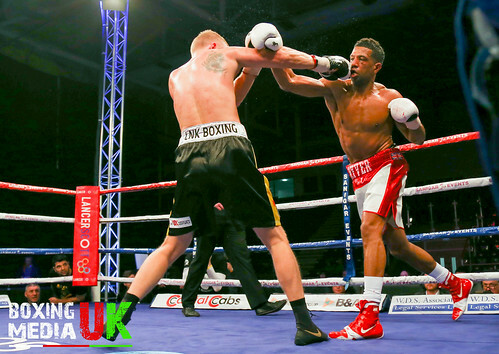 All in all a succesful night of boxing took place at the Cardiff Ice Arena. Credit has got go to Sanigar Events, who must have felt the “fire and Ice” show was a curse aftyer suffering so many withdrawals and changes. 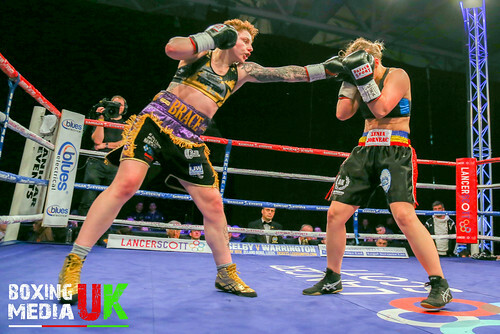 The main event and highlights of the undercard were filmed by S4C who continue to do a great job of showcasing the deep pool of talent we now have in Welsh boxing. Michael Ward reporting from ringside.